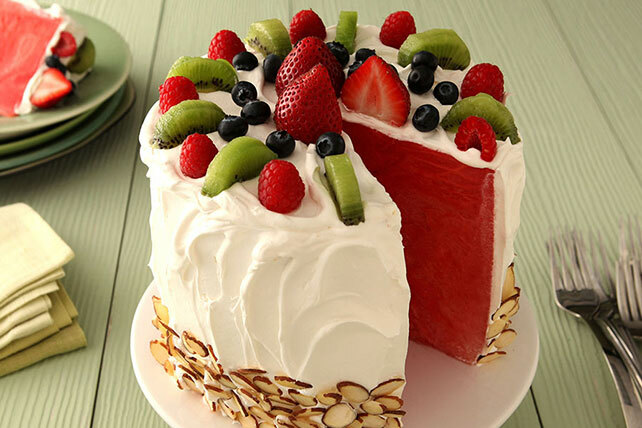 Put your seasonal summer produce to delicious use with this sweet and refreshing Watermelon “Cake” recipe. Made of sweet, refreshing watermelon and frosted with creamy COOL WHIP Whipped Topping, this fun fruit dessert is perfect for your next summer get-together! Bonus: this recipe can be made ahead of time for easy party prep! Substitute toasted flaked coconut for the nuts.